This podcast talks about Restaurant Inspiration with Chef Ana Ros. Chef Ana Ros along with here husband owns Hisa Franko, a fine dining Restaurant in Slovenia. Ana’s story is truly inspiring, she never received a a classical training, but has developed her own style and techniques and her determination has seen her been recognised amongst the world’s best chefs. Not originally planning a career as a Chef, she meet her husband whose parents owned Hisa Franko. He was a trained sommelier and when his parents handed the reins of the Restaurant to him, Ana stepped into the kitchen. Her determination to succeed saw her learn the techniques of a chef, learn how to manage a team and how to run the Restaurant. We talk about the earlier years and how she was able to build her repertoire of techniques in the kitchen, the process she went through build her skills. We also look at the process she takes to create a new dish, and the way that she is not only integrating local produce into the menu. But working to build the supply chain to enable local commerce and to showcase the amazing ingredients that she is able to source from around Hisa Franko. This year she was Voted the World’s Best Female Chef. JAMES ELING: Hey, it’s James from Marketing4 Restaurants here. Welcome to Episode 43 of Secret Sauce, Restaurant Marketing podcast: Inspiration and Creativity with Chef Ana Ros from Hisa Franko, the World’s Best Female Chef. Hey, hey, everyone! Welcome back to the podcast. As you know from the last podcast, [I was] lucky enough to be able to attend the World’s 50 Best Restaurants. And much, much, much luckier today to actually interview Chef Ana Ros from Hisa Franko. Hisa Franko is a restaurant in Slovenia and she has been voted as the World’s Best Female Chef. Now, I’m not going to say too much because when you’ve got someone as talented, creative, and inspiring as Chef Ana Ros, I think we should let her do the talking. James: Chef Ros, Welcome to the podcast! Ana: Oh yeah, Thank you so much. And hello to far away Australia. James: Yes, well, I think we’ve got listeners now in 110 countries. We’ve definitely got a lot of listeners in Australia, but it will travel quite widely. Congratulations on being named the World’s Best Female Chef. That’s a really exciting accolade for you. Your restaurant Hisa Franko in Slovenia – will you be able to tell us a little bit about it? Ana: Yeah, of course, with pleasure. It is a very beautiful old country style house placed on the extreme northwestern part of Slovenia high west in a way. It’s very difficult to reach because we are in an Alpine Valley, which has no highway to reach it. So, you need to drive to get here. On the other side is nature – this area remains really untouched and very original. I think it is probably one of the most beautiful, if not the most beautiful, Alpine valley absolutely in Europe. But maybe it can compete with the beauty of New Zealand, maybe. By the Alpine scenery, we have two cross rivers and inland green forest. This is where we get our ingredients from, by being so far away from the suppliers. We created the biggest chain of local producers and this is what makes our food unexpected. James: So, how did you start out? What was it that got you into before being a chef? What was it that got you started at Hisa Franko? Ana: Well, it’s funny–it was love really. It’s funny because normally, children dream from their childhood from an early age, what they want to become in their life. I actually never talked about anything because I was into sports as a kid, and a dancer and a pretty good student. But no, I had no pictured dreams of what I should do in my life. So, this is how when I finished high school I decided to study International Science in Diplomacy because it looked, like a good compromise for someone who does not know what to do in his life. It’s a fantastic course which gives you a very good scale of knowledge like speaking five languages, a great knowledge of history, economics, international policies–so really a great thing. I don’t think I could have worked in a Soviet university when I understood diplomatic world was not for me, that it’s pretty boring on a long scale. So, I was more thinking about translation but it all went bad because I met my husband when I was just finishing the university and he had this little restaurant on the Slovenian countryside. Despite that, I would despair because my parents decided I would not travel, not to move to Brussels [Belgium] to continue my translation diplomatic career, but to the remain in the valley and slowly take over Hisa Franko. But I didn’t start cooking right away in the first year. We’ve been more managing the place with my five languages. It was great to work in the service and be pregnant with my first [child]. By the time, I was 30 years old, I needed to decide [whether I would] to go into the kitchen and this is how I actually closed the door for a lot of years to the outside world a little bit because I needed to start from the whole beginning. Working basic techniques like recognizing meat, bread, clean fish. So, you can imagine it was really, really hard the first 10 years and I had two babies at that time. James: Which is just incredible in itself because it’s very hard to run a restaurant and you’re trying to learn those techniques. Can you tell us a little bit more about those early years? Because I imagine with kids and a restaurant it would have been quite stressful. Ana: Well, yes if I think back now. I sometimes tell myself, I mean, I can’t believe you went through all that. I think I was very much disciplined and this is what sports gave me. Meaning that I didn’t give up when things went wrong. I mean, I trooped down but then I started from the beginning. It’s true, I’m a very study-like person so I have plenty books at home–it’s mostly technical books I just was really interested in. The children have been really great. They have been working with an animal instinct. Gypsy-style, they’re always with me. Sometimes we’d be, like, all over the house they’ll be with me. Sometimes we sleep on the floor. I organize a bed on the floor so they could wait for me. I really try to always have them close by. And today, they are 13 and 14 years old, and everybody who meets them say what a fantastic work I have done. They are really, really great children, super socialized, super behaved they are great in sports, very good at school flow. You can do it when you’re focused and when you really want it. Anyway, the recognition came pretty early. I think I started cooking in 2002. I think, by 2006, I’ve been invited to the first international conference in Toulouse, France. It was about the future stars from the gastronomy. Alex Atala, was there, Mauro Colagreco was there, Mehmet Gürs was there. We still miss each other and this make up part of the community of chefs is pretty funny. This is when also Felix, my other chef coming in the restaurant always told that the kitchen was very creative. I think I’m a creative personality. I was also seriously into dance for many years. I think creativity is something you just have–it’s kind of a talent. I just needed to make sure that my hands could follow my head. Work harder techniques. I think there was a day I understood it, it became like a flow that I can actually realize my mind through my hands. I’m still learning every day like everyone else should, I think. Every chef should be walking around the world with his eyes wide open and try to understand different approaches from his chef colleagues. Also, I think by being self-taught and by trying to understand a lot of things by myself, we realized a very specific cuisine which has nothing to do with food of anyone else. Sometimes techniques even look like another way around but this is what makes you so much more interesting. James: So was it really four years, from you getting into the kitchen to being recognized as one of the leading international chefs. Is that right? Ana: No, I didn’t take the recognition, I didn’t take the invitation to Toulouse which was followed by many others after that. Especially in a region, meaning Italy, France. I was really, really working during the last conferences in France because my French is also fluent but I didn’t take it as a recognition, I took it more as an opportunity to meet my colleagues and these were the people I was highly admiring and to learn from them. Because every time if you listen, if you pay attention, every dinner you work with someone, every conversation you have with someone can be a learning process. So, I took it more as a grade base for networking. But you know, I think sometimes we forget how much cooking from yourself, realizing your territory, your season and especially your personality which in my case is pretty creative is important. Sometimes it is more of an excuse if the technique is missing or something like there is a mistake than a boring, super boring meal. I think that was like might be last in this whole trip. James: It’s amazing that you’ve developed that recognition really quite quickly. Ana: No, I think it took 15 years since I actually stepped into the kitchen and up to now I would say it’s exactly 15 years. So, in the first years you can consider them like schooling years because I really worked hard. I worked double than a 16-year-old guy who goes to culinary school. I think if you’re motivated you can learn pretty fast, it’s pretty explainable I would say. James: And how has the cuisine changed over those 15 years? What’s the journey been like with the menu at Hisa Franko? Ana: I think it’s changed a lot of course. It changes especially about the sensibility towards the local environment and searching into the old techniques or old traditions. I also, and always, think that cooking is evolution. Meaning that even If I look in the menu, my menu three years ago and my menus now I see a big difference. Which is not necessarily is taken by guests as always positive because chefs work really from themselves, express themselves, their state of mind, their state of maturity. So not necessarily the cuisine is more pleasant but absolutely it is an evolution. There were some dishes that were really interesting already on the menu 10 years ago. I can’t say 15 years ago because I was like really, really at the beginning trying to understand how to make bread, let’s say. But 10 years ago, meaning five years after I started, I think if I look in the menu there were some pretty good dishes already. My only problem is I don’t believe in signature dishes. Because I believe that cooking is always, as I said before, an evolutionary process. Meaning that the dishes I have been cooking two or three years ago have nothing to do with the menu we are realizing today. It’s a question of little details, a question of the lightness of the menu. So, I can’t it is useless to compare, sometimes people ask me, “Do you remember this coffee pasta with lemon and sea bass I would like to have it again?” And I’m like, “I can’t cook it again.” It’s impossible! I can’t, I mean a memory sounds great but then you try to do it, it is still, what did you think? You know you can’t move where in the world of the recipes you’ve been doing so many years ago. James: Yeah, yeah. So how important is local produce now for you? Ana: As I said before, we, in these 15 years I think were all of them dedicated into building a chain of local producers which is absolute kilometer zero. Even the fish that we buy, the sea fish or the seafood that we are using come from the Bay of Trieste. From the lagoon that we can see, from the mountains already from 1,000 feet, where you can spot the whole Gulf of Trieste. I think we can definitely control our products very well. We have the freshest possible products, which never travel, but at the same time, we have also original products which is very often very different from products from other areas. So, it was a need at the time we started, it is great pleasure now to see that it’s the biggest work that we did, that was actually this chain of producers that make this community also live very well. Imagine, if a farmer knows that he can sell those she-lambs or Goat cheese or butter or mountain milk or the forager mushrooms he picked he will continue doing it. Meaning that the traditions will stay and it may be a great motivation also for younger generations not to move to the cities but stay in the countryside. We are giving them some economical support and some reason to make them stay here and continue with tradition. On the other side, we have the best possible products which has never traveled. James: So, that you do quite a bit of work in managing that supply chain and even developing it with the Tolminc cheese [a local milk cheese, native of Slovenia]? Ana: Yeah, we built, my husband actually built a cheese cellar in the house. He was really interested in regard of seasoning local cheeses. It’s all mountain cheeses which come from the meadows between 1100 to 2200 meters. It’s made from raw milk, so all of the quality of the nature around the industries with respect to the cheese, the cheeses are always eaten fresh. The problem was, the meadows in the mountains are owned by communities of farmers and so this on the number of cows ,this is the number of the days they need to work on the meadow and this is also the quantity of the cheese they get. So, the cheese is distributed so it’s not too many cheeses in one family and inside the family, the cheese is divided again. Meaning that it’s not enough of it to season it. So, this is why my husband built the cheese cellar to give the local cheese a chance to age, to mature. To see what happens and, in this moment, I think the best results are between four and five years of seasoning with controlled temperature and the heat. I can say it is pretty close to the best possible Parmigiano [Reggiano]. James: Now that’s excellent. It’s excellent that you put that work in to be able to develop the supply chain because not many restaurants are forward-thinking like that. Ana: Yeah, but you know, we have to. Let’s say with local vineyard’s lamb, we need to know if the lamb is not okay. We have to understand, we have to know what happened. So, you know butchering is such an important process or waiting time, hanging time so we go through all these processes with our farmers because I can support the local community, but the local community must also learn how to give us the best possible product. You know, nature can be brilliant. And the foods from lamb can be brilliant. But if the lamb is butchered in a long way or the like hanging time is not enough, the meat is just not going to be good. We need to go through all these processes with them. This is also great for them because, at the same time, the lamb they have at home and what they eat at home is of far better quality. Husband-wife team – good or bad idea? James: Excellent! You’ve mentioned your husband Valter is the sommelier at Hisa Franko. Ana: Yes, my husband is actually the sommelier. He’s the son of old Franko who did the restaurant. He took over at the beginning of 2000. But I would say that he did a big job already before by trying to, let’s say, push his parents into more looking around their territory. I think it was like this future generation is always so difficult. So, when we were deciding who should take over the kitchen because he originally is a cook, trained cook. We decided it should be me because he was he was so deeply into the wine business already that he was considered an old Slovenian analogist that time. He really like was discovering the local new wine producers. I believed always in natural wines, organic wines. It is what he has been drinking since I knew him. Now, when we are talking about the trend of organic wine, he really has a lot of Slovenian producers. He was never able to sell a lot because his wines are so extreme and now he goes to Paris and to New York and everybody loves his wines, and he doesn’t even produce enough anymore. And now I am so proud of Valter’s work–about the wines because it is really something he deeply believes in. James: Now, having been married to the sommelier, do you think that it gives you an advantage, in a way, because he’s been tasting your cooking for so long and you’ve been drinking the wines that he’s working with for so long? Ana: No, I don’t think it’s an advantage. You know, I never forget we are couple so we bring all our disputes about how the food should look like. No, more like he sometimes says to me, “Ana, come on stop changing the menu. I can’t follow you anymore. Can you be more serious some taste less, I really have problems with it.” And I’m challenging him all the time because we bring these challenges home, too. So, it’s pretty awkward sometimes. So, I don’t believe there is a big advantage of having, marrying, or working partner or a sommelier because you go for private dinner and you talk business, and you go to a holiday and you continue talking business. So, it’s like you have advantages and disadvantages. James: I know exactly what you’re talking about ‘cause I work with my wife as well. She’s my business partner. It’s very hard to switch off. It’s hard to make that work, like, work- life balance. Ana: So, let’s say she’s not listening now. James: How often do you change the menu? Ana: We don’t really change menus, we change single dishes. So, we observe the nature and seasons, and this is how we move. So, we just completed the early spring menu, but it is the menu that is in a constant evolution. Let’s say morel, having grown for three weeks, and now they’re gone so we need to switch it to another dish. The rabbit is ready and so we put the rabbit on the menu. The menu is a constant evolution, so we never say okay, this is early spring menu then cut it off and then this is the late spring menu. No, there are changes around here and they go on after so we go dish by dish. We follow what is going on around you and this is how we change. Our restaurant inspiration depends heavily on the seasons. James: Do you start with an ingredient and then work the dish from there or what is the process that you would go through in developing a new dish? How does restaurant inspiration work? Ana: It is very interesting and it really depends. Sometimes, most of the time, it is really working around one ingredient. Let’s say, we have lamb and then you work around it. I always want to understand the scenario, the story around the dish. I think it is the storytelling but not by the waiter but by the chef who has prepared it. So, in the case of our lamb we’ve been working on the idea, we have a sea breeze which comes up to our mountain because we’re very close to the sea. And with that mineral from the soil changes and with the different soil the plants are different and this is how the lamb has different food, more mineral food. So that’s why we, let’s say, compose in a dish lamb and crab together working then around that story. The storytelling by the chef then again by the waiter is super, super important in my opinion. That’s sometimes where we get restaurant inspiration. Sometimes it works like that, sometimes you walk in the nature. It can be a natural source of restaurant inspiration. I really spend a lot of time around nature. You walk in the nature you think everything is better. And you understand that, normally, the things that grow together they naturally go with each each other. Sometimes you more work around a contrast, sometimes, it’s more important than the ingredient itself. In this case, let’s say you’re having at this moment a thin asparagus, you marinade it through salt with egg yolk, cooked in oil with fresh linden leaves, [served] with fried bread and a can of prosciutto made of mussels and mussel water. So, the idea of that dish and restaurant inspiration were actually the idea of a composition in the nature walking through the woods. So, it really, really depends. Sometimes you dream dishes. I do, I’m a very big dreamer and I often dream of a dish. Ana: I do, yes, of course. I do. Sometimes I wake up in the morning taking coffee then and I’m searching for paper and a pencil just to write down what just happened in my dream. James: That’s awesome restaurant inspiration! You’re renowned for the innovative menu in your cooking style. 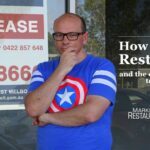 In the restaurant, what’s the balance of sort of regulars, locals as opposed to international tourists who are coming specifically to eat at the restaurant? Ana: That’s an interesting question. The percentage keeps on changing all the time. At the moment, we have the restaurant booked out for the next week or two weeks. The whole house doesn’t have a place until the end of November. We still try to keep some tables, like separate tables apart for locals, because they are not used to ringing in the restaurant two weeks before, a month before to make a reservation to make sure they have place. So, we are a countryside house, which has a hotel. For us, a local person in our restaurant is very important. So, probably the numbers in the last year, changed a lot. Before, we probably had like 30% of Slovenians, then you have a good percentage of Austrians, Germans, Italians which are our neighbouring countries. Then you have the rest of the world. Now, we probably went down close to 10% of Slovenians. Yes, even Austrian, Italian, German guests probably went down. That’s why we still do the reception end of booking tables personally. Meaning that we don’t have any reservation system which blocks you before you talk to us. We talk to every single person which requests a table, so we reply to every single email and we keep this inside. Ana: So, we can understand if someone can’t come tomorrow because he come in one month. So, every single person we reply to personally. They email normally. James: How many seats is the restaurant? Ana: We have around 50 seats. Ana: Around 50, depends then if there’s some bigger party then the number goes a little bit down. But it’s never over 50 between 45 and 50. I would say. James: Lovely. So, a lot of restaurant owners work really long hours and I think the big struggle for them is to sort of see a little bit of inspiration, a little bit of creativity in their little way that they can sort of improve their restaurant. What advice would you give to someone who’s gone so quickly to build an amazing restaurant? What advice would you give a chef or a restaurant owner? What are the important lessons that you’ve learned? Ana: You know, it’s interesting. I think I would say, first of all, keep a piece of private life. It’s super important. Try to make your life is happy, and especially do something for yourself. So last year was a really super, super heavy year. After Netflix came out, the Chef’s Table. Our website visits came up from from 200 to 10,000. We got loaded by work. If before we may have days that we worked a little bit less and we could rest on those days. I mean now, the request is for every single day. There is a waiting list for the restaurant now. That was a big lesson. I was so tired last year and I looked sometimes at pictures, you could see my face—it was not tired, it was happy. It wasn’t okay and why would you do things if you’re not happy with them. If you want to keep going in a good mood, if you want to remain motivated. If you want to remain creative you absolutely need to take care of your private life, especially for female chefs. I mean, we do have children, normally. I mean, I don’t say everyone does. So, imagine when I don’t know my children are two and three when they say, “Mum, I feel bad because you never spend time with me.” That’s wrong. And so, that’s a conflict for a woman. So, I think, “So I wake up one hour earlier than I usually do. I do one hour of sports so I wouldn’t be stressed out and with that I opened my energies and when I start working I’m a happy person. And when I finish my day I always make sure that I have my meal with my family. And for that half an hour, my guests, my team can absolutely miss me. If my children have a running competition and if they tell me they need me. I take down the apron, take off my cooking jacket and I go with them. It’s important, that’s why it’s very important to build a good team around. You can’t manage it yourself. And a good team, if you should miss for hour or two can do without you which means sharing the work that’s like a future. And if you are able to make your life happy, I’m sure you will never have troubles with the creativity and motivation. James: I think that’s a really good point, the work-life balance I think is critical. A lot of people miss out on that we all work long hours. Building a team how did you go around, did your do earlier studies, your sports background, what was it that helped you to build the team that was to support you to get to where you are today? Ana: Oh, I always had trouble with that. Because we are so much far away from the cities here it’s such a countryside. Locally, I mean there is not a lot of young people that I can see working in gastronomy. So, we always need to track people from elsewhere but with that is a problem because a lot of them are not used to living in the countryside where you are surrounded by cows, sheep and goats and there is one bar, one hairdresser and one post office. It looks like really, really far away. I think a big change happened last year, I always, always struggle with motivating the team to stay and to work as work should be done, I understood at one point that I cannot do it alone anymore. I hired a fantastic girl. She’s American and she worked in some of the best restaurants in the world. She helps me sort out a story of how to motivate young people to be happy when they work because the important thing is not only the chef must be happy but also everyone who works for you needs to be happy otherwise the food is just tired. We are working out a brilliant piece for now and whoever comes to the kitchen says, “I can’t believe everybody is always in such a good mood and still so, too much working.” Yeah, it’s difficult. Sharing good moments and sharing bad moments. Talking a lot of people is good for them. James: Yeah, communication and building a team it’s critical. James: Well, I think that’s about it. I think we’ve covered a lot of interesting ground. You’ve shared a lot of wisdom from your journey and restaurant inspiration that’s led you to being named the World’s Best Female Chef, which is really amazing. Thank you very much, Chef Ross for your time. Ana: Yes, thank you so much! I have a lot work today to do but I already did my hour of sports so, I just need my list of things to do and it’s like probably 14 hours. I’m okay, I’m in a good mood. It’s important. James: Alright, Thank you very much. Ana: All the best. Bye. Ana: You’re welcome! Bye, bye. James: So, everyone what did you think of that? I think it’s a really amazing story and I said this before in the previous podcast, but I just find it an amazing story that she can start working in the kitchen with no formal training and 15 years later be recognized as the World’s Best Female Chef. I just think that is a truly inspiring story and I think that there is something in there for everyone. This isn’t a chef for a restaurant thing, I think this is a life thing. Just an amazing story about what you can achieve when you put your mind to it. Obviously, very talented woman really inspiring it was great of her to share so freely her ideas and her thoughts about what has led to her being so successful. So that’s it. I’m hoping that you can get something out of this podcast so that you can be little bit more successful tomorrow. And that your beginning in three years’ time will be a lot more successful than you are now. That’s it! Have an outstanding day. Bye. Zomato Buys Urbanspoon to expand into the United States and Australia.